The Rock Solid Pro Music/Mic Stand Kit is an ideal addition to any studio, sound booth or concert venue where music or microphone stands are utilized. 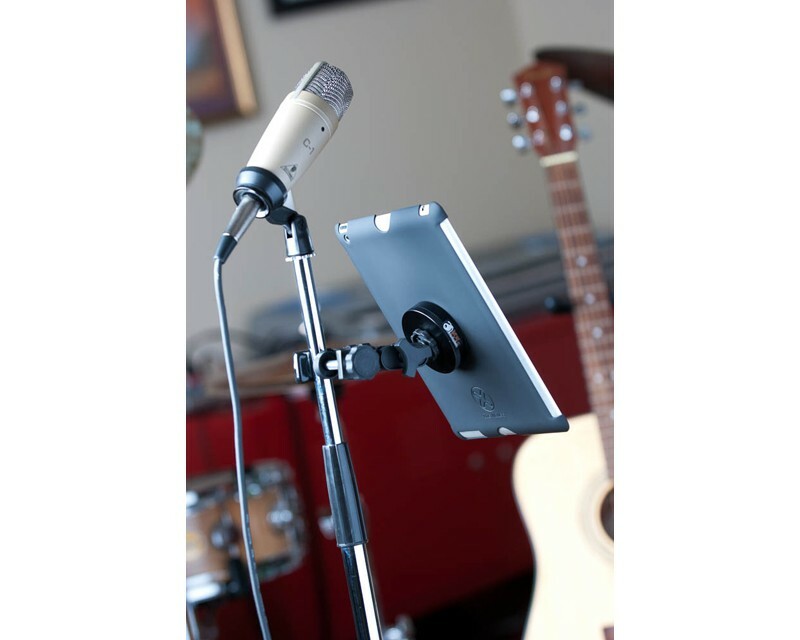 Mount an iPad to the top or column of any standard mic stand or boom. Ideal for voice-over, script reading, music recording, performing and practicing. The Rock Solid Pro Music/Mic Kit includes everything you need to mount your Wallee Case (sold separately) to a standard microphone or music stand. The kit also mounts to an stands column or music tray’s flat surface. For a complete overview and video of the Wallee System please click here. Included in the Rock Solid Pro Music/Mic Kit is the EasyGrip articulating ball-head assembly which allows for angling of the tablet in just about any position. Attach the EasyGrip’s removable ballhead assembly directly to the Rock Solid Microphone Adapter for a full range of tablet positioning on the top of the mic stand, or attach the EasyGrip Clamp directly to the stand’s column allowing a microphone on the top of the stand and a tablet positioned below. The Rock Solid Pro Music/Mic Kit is designed for easy transport and can be added to any standard microphone stand or boom. Simply show up at the venue and position the tablet exactly as needed. Already own the Connect or Connect Lite Bracket? This configuration can be achieved by simply purchasing the EasyGrip ST and Rock Solid Microphone Stand Adapter. *Listing is for the Rock Sold Mic Kit only. Wallee case and other items pictured sold separately.